Linksys Wemo Dimmer Wi-Fi Light Switch 2-pack, Works with Amazon Alexa. CONTROL AND DIM YOUR LIGHTS FROM ANYWHERE. Easily set the ambiance of any room and control your lights from anywhere with Wemo Dimmer. This smart dimmer connects to your existing home Wi-Fi network to provide wireless control of your lights with no subscription or hub required. From bedroom lights and dining room chandeliers to recessed lighting, Wemo Dimmer can control nearly anything that a traditional dimmer switch can. Whether you're unwinding on the couch, meeting in the boardroom, or vacationing in Barbados, you'll be able to remotely control and dim your home lighting from anywhere. SAY IT: HANDS-FREE CONTROL WITH AMAZON ALEXA AND GOOGLE ASSISTANT. Wemo Dimmer works seamlessly with Google Assistant and Amazon Alexa to give you hands-free voice control over your lights. Pair Wemo Dimmer with Amazon Alexa or Google Assistant built-in devices like Google Home to dim your lights with just the power of your voice. PREVENT BRIGHT-LIGHT BLINDING WITH NIGHT MODE. Want to minimize bright-light blinding when you're getting a midnight snack or checking in on the kids? With "Night Mode" you can set your Wemo Dimmer to turn on to a lower light level during specific times. SET WORRY-FREE SCHEDULES FOR YOUR LIGHTS. Wemo Dimmer lets you easily set automatic schedules for any light. Using the free Wemo app, you can schedule your hall lights to turn off at sunrise, or synchronize your living room lights with the sunset so you never come home to a dark house. Wemo Dimmer will calibrate to work with your specific type of bulb from LEDs and CFLs to incandescent bulbs. No matter what type of bulb you're using, you'll enjoy the maximum amount of dimming range with no flickering. CONTROL MULTIPLE WEMO DEVICES WITH A SINGLE PRESS. Your Wemo Dimmer can do so much more than dim. With the Long Press feature, you can set any number of other Wemo devices to respond to a two-second press of the Dimmer button. Maybe you want Long Press to turn everything off. Or put all your Wemos into Away Light mode when you leave for vacation. If you've got two seconds, we've got a lot of options. PAIRS WITH NEST FOR AUTOMATIC HOME-AWAY CONTROL. When paired with Nest, Nest's home and away mode can sync with your Wemo Dimmer for automatic control. Nest can tell Wemo when you're home or away, so your living room lights can greet you when you come home, and switch off when you're away to conserve energy. WORKS WITH IFTTT FOR AUTOMATED RECIPES. "If This, Then That" is a free web-based service that offers an amazing array of possibilities for your Wemo Dimmer. 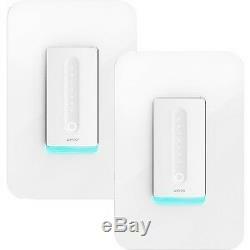 Wemo Wi-Fi Smart Dimmer 2-Pack. The item "Linksys Wemo Dimmer Wi-Fi Light Switch 2-pack, Works with Amazon Alexa" is in sale since Friday, June 1, 2018. This item is in the category "Consumer Electronics\Multipurpose Batteries & Power\Surge Protectors, Power Strips". The seller is "nothingbutsavings" and is located in LaGrange, OH. This item can be shipped to United States.